In 1950, the legendary postwar crime reporter Percy Hoskins (of the Daily Express) published a book whose title would later be appropriated by a landmark British television series. This book, No Hiding Place, promised to be “the full authentic story of Scotland Yard in action” and it remains a compulsive read to this day, not least for its helpful guide to underworld slang, presented in an appendix “for the benefit of the young detective”. From this we learn such standard slang terms as bracelets for handcuffs, dabs for fingerprints, and milky for cowardly, but also less guessable coinings, such as He did a tray on the Cave-grinder (he got three months’ hard labour), Kybosh (one and sixpence) and On the Jamclout (shoplifting). At this distance in time, such unlikely stuff probably raises more questions than it answers. For example, why would “on the jamclout” mean shoplifting, when “jamclout” surely means sanitary towel? Was Percy Hoskins being had on? Were unscrupulous criminals shooting him a line? Consulting other, later slang dictionaries I couldn’t find the expression at all, but if we go back to trusty Eric Partridge, in his Dictionary of the Underworld (also 1950), we find him quoting a source from 1933: “One member of a team makes a small purchase and holds the clerk’s attention while the other steals.” Ah ha. You will notice that Partridge doesn’t specify the exact type of small purchase, perhaps out of delicacy, but I think we are finally getting closer to the etymology, if we use our loaves to join the dots. “I was watching out for my girls,” Dummy replied. 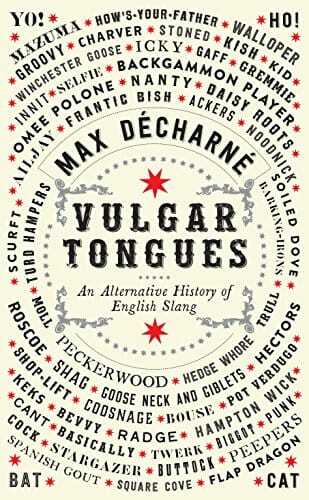 The main effect of Vulgar Tongues in my own case is to make me feel inadequate and ill-read. Why have I never even heard of the “classic” hobo memoir by Jack Black, You Can’t Win (1926), or Robin Cook’s “landmark” debut novel The Crust on Its Uppers (1962)? Good heavens, I didn’t even know that Cootie Williams had a band called the Rug Cutters! I would disagree a bit with the book’s sub-title, “An Alternative History of English Slang”, when so much of the slang turns out to be American in origin, and of course I think it’s a shame no one pointed Decharne towards Percy Hoskins’s classic No Hiding Place with its invaluable appendix giving us “On the Rip-Rap” (cadging) and “On the Ear ’Ole” (also cadging). But you certainly finish this book agreeing with John Simpson, the recently retired chief editor of the Oxford English Dictionary, who campaigned throughout his tenure to gather words from wider sources. His predecessor, Robert Burchfield, famously preferred to wait for words and expressions to be used in respectable quarters, such as the Times newspaper and the literary novel. I’m guessing you could waste a lot of decades waiting for the expression “shove in your clutch” to turn up in the novels of A.S. Byatt. And meanwhile the language would be much the poorer without it.